Adults, teens, tweens and kids attending the Wednesday Night Program on the steps in front of the fieldhouse/community centre in Heron Park on Wednesday, July 11, 2012. The Wednesday Night Program continues to evolve. Originally pitched as an activity evening for at-risk teens and tweens, it has become a popular event for families with young children, and an opportunity for local teens to gain volunteer hours for high school. We continue to offer structured and unstructured physical activities, food and fun for residents of all ages. Adult supervision provided. Parents are always welcome. 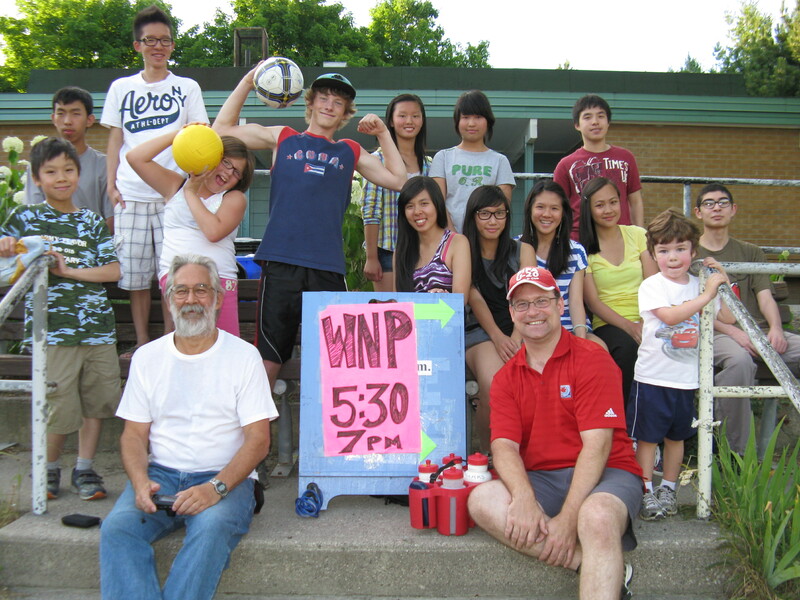 The WNP is every Wednesday from 5:30 p.m. to 7 p.m.
WNP a big hit with the kids! Colin, Ricardo and Chris pose with neighbourhood kids. The Wednesday Night Program continues to enjoy great support from the neighbourhood. This photo was taken on June 24. We took a night off on July 1 to celebrate Canada Day on the Hill, but we’ll be back in action on Wednesday, July 8. More fun-filled evenings of supervised activities, food and games. 5:30 to 7:30pm every Wednesday in Heron Park. See you at the WNP! The Wednesday Night Program was started a year ago to provide local kids and teens with supervised sports and games, a meal, and literacy and numeracy support each Wednesday Night in Heron Park. We have made good use of the recently improved Community Centre and the play areas in the park during the past four seasons. o In total, close to 150 people, who have participated in some fashion in the Wednesday Night program since its inception in the spring of 2008. Weather-permitting, we played a variety of seasonal sports in the fields, rink and basketball court in Heron Park. In inclement weather when we moved indoors, we had logic puzzles such as Ken-Ken and Sudoku to challenge us. Hang-man and card games were also used to encourage teamwork and gamesmanship. On the rare occasions that hotdogs and microwave-food weren’t served, we treated ourselves to delicious pizza from O’Brien’s Eatery and Pub. Through the winter we averaged close to 5 youth per Wednesday. Now that summer is almost upon us, we are once again starting to see a greater number of young children and their parents and we expect the numbers of older children and teens to reach last year’s average of 10 per week. The WNP continues to enjoy broad-based support throughout Heron Park and last fall we were very fortunate to have received a one-time-funding grant of $3000 from the City of Ottawa, a commitment of $300 from the Heron Park Community Association and donations from individuals totalling more than $600. Funding the program has taken more than a few hours of preparing proposals and organizing events, but as you can see, the results have been well worth the effort. Given our success, we were more than happy to donate food and drink from the Wednesday Night Program to help raise funds during the Garage Sale on May 9. We set up tables outside the Community Centre the morning of the sale. Proceeds from selling HPCA memberships, hotdogs, coffee and juice boxes were donated to the HPCA and its Play Structure Fund. We raised more than $80–in spite of the torrential rain that started after 10:30 a.m. A huge thanks to Nick Boucher, Justin Leblanc, and John and Matt Jannack who helped out on the day of the sale. The following people have been integral to the continued success of the Wednesday Night Program: Bing Dang, John and Diane MacFarlane, Ricardo Roa, and Nadine Umugiraneza. Their participation has ensured that we have been able to maintain a minimum of 3 adults for supervision. Many hands have made for light work. Now, if only the kids and teens would start helping out without being asked to! Of course, it goes without saying that without the continued participation of kids, teens and parents from the neighbourhood, there wouldn’t be a Wednesday Night Program. Thanks to all of you, we have one year under our belts and we look forward to many more. See you in the park on Wednesdays between 5:30 and 7:30 p.m!